Earlier this evening, Apple announced a major change up in their executive management. 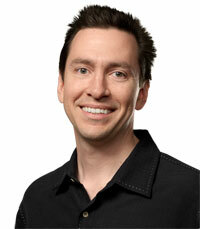 Most notably, Apple Senior Vice President of iOS Software Scott Forstall will be leaving. Forstall moved over to an advisory role effective immediately, and will ultimately depart Apple in 2013. As Senior Vice President of iOS Software, Scott Forstall has been a prominent public figure at Apple. He was originally recruited to NeXT, Inc. after college and came to Apple with Steve Jobs after Apple's acquisition of NeXT in 1996. He has been on stage numerous times during Apple keynotes to demo the latest iOS features. Forstall was even profiled as Apple's CEO-in-Waiting back in January. That article, however, was a not always flattering look at the executive who reportedly had many clashes with others at Apple. More recently, there was described to be an internal political divide in Apple about the use of skeuomorphism, the inclusion of certain ornamental elements in a product that are carried over from previous tools addressing the same task for which the elements were required for functionality. According to the report, Apple's iOS chief Scott Forstall has long been a proponent of incorporating skeuomorphic features in the company's software, with Steve Jobs having supported and even originated that design direction for Apple's products. But others such as hardware guru Jonathan Ive find the inclusion of such features distasteful, and Apple's designers have reportedly been divided into camps over which direction to take Apple's products. In light of the shakeup, Jonathan Ive is now taking over Apple's Human Interface teams. Forstall is not walking away; he was pushed. Potential factors that worked against Forstall: his design taste, engineering management, abrasive style, and the whole iOS 6 Maps thing. I also wonder how much Forstall was effectively protected by his close relationship with Steve Jobs — protection which, obviously, no longer exists. I also heard that Forstall refused to sign the letter apologizing for the mapping fiasco, sealing his fate at Apple. Lashinsky is referring to a public apology posted by Apple CEO Tim Cook about iOS 6's Maps. The Map app in iOS 6 replaced Google Maps with Apple's own proprietary solution. After a significant amount of criticism after iOS 6's launch, Cook wrote an open letter apologizing to customers about not meeting expectations. Update: The Wall Street Journal confirms a similar story with their sources. The article also reiterates that Forstall clashed with others at Apple. One source even said he was difficult to work with and "never fit into the culture of Apple". Let's not forget that Steve Jobs was forced out of Apple before too. Perhaps we'll see the second coming of Scott Forstall? I don't think Steve would have apologized about Maps, either. I think he would have fiercely defended it and stated why it's way far beyond anything google maps was at its inception and that it's only going to get better. My guess is Forstall felt the same way. Either way, I'm looking forward to Ive UIs. Hopefully skeuomorphism gets kicked to the curb. Steve sided with Scott. Steve supported skeuomorphism. If anything, Scott would still have his Job is Steve was here. I actually liked him. He was weird in the keynotes, but you could really tell that he loved the products. Great news. Ive is Apple. Who thinks Google hires him? I am definitely happy that John Browett left. But Forstall, not so much. Yes, I do hate the old fashioned calendar, but how do we know as the public that Forstall hadn't been part of more than just the design of those specific apps? I feel like forcing someone out for doing a job that Steve Jobs wanted them to do is not something that Apple should do.